The Curiosity mission held a press briefing this morning for the first time since the American Geophysical Union meeting, and it was jam-packed with science. You can watch a recording here, and see the photos that were discussed here. The biggest piece of news is this: it was worth it, scientifically, to go to Glenelg first, before heading to the mountain. Now, let me back up and give a little context for that statement. Curiosity landed about five months ago, and then began a long and sometimes agonizingly slow process of going through all of the mission's "first-time activities." They're still not done. 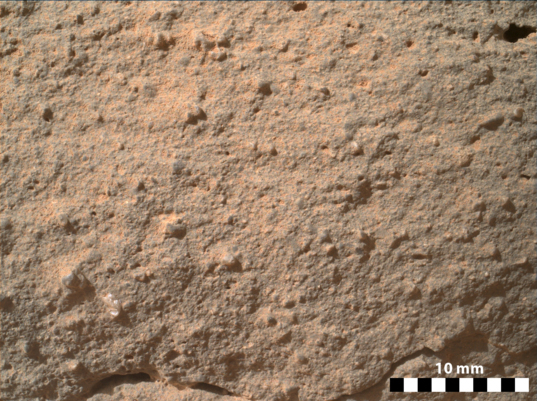 There remains one more major task that Curiosity has to do for the first time: drill into a rock to acquire a powdered sample from its interior and deliver it to the Chemin and SAM instruments. Until they've successfully hurdled that obstacle, the engineers haven't yet really proven that the rover can do everything it was sent to Mars to do. Now, the scientists knew that this process was going to take a while (though maybe not this long; it had originally been hoped that they would do their first drilling before the end of 2012). 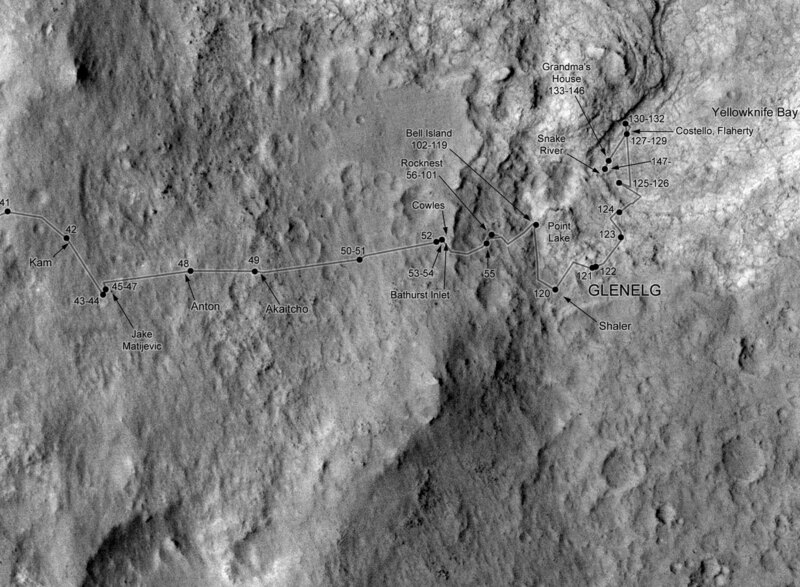 So when they were told that they could suggest where the rover should go in order to do all these first-time activities, they faced a choice. Start the trip toward the southwest, and Gale crater's central mountain, where there are rocks that orbiting missions indicate are super cool? Or drive a few hundred meters northeast, to a rock that looks interesting from space but we don't know what it is that gives it its unusual properties? It was a tough choice. Driving southwest would get them to the mountain faster, but at a scientific cost: these first five or six months of initial work would be performed on rocks that don't look particularly notable from orbit. Driving northeast would delay their arrival at the mountain, but there was a chance that this rock that looked interesting from space would turn out actually to be interesting when seen on the ground, so they might get some good science done during the testing period. 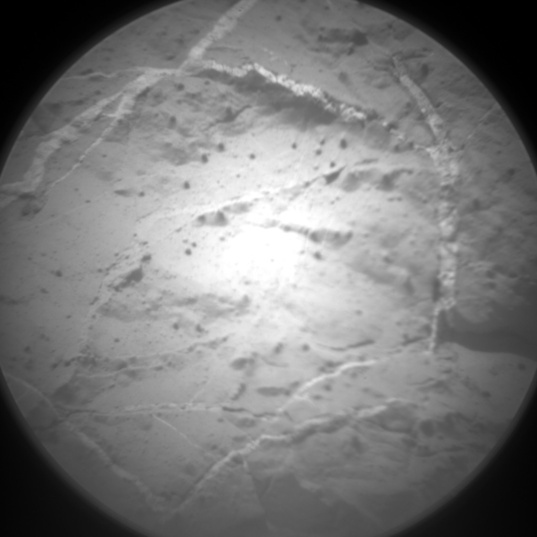 The Curiosity science team gambled on the closer target. And they won. The stuff at Glenelg turns out to be a sequence of diverse sedimentary rocks that seem to have been deposited by liquid water, then turned into rock, which was, some time later, saturated again with liquid water, leaving concretions and gypsum veins in their wake. Water, water, everywhere, and at multiple times in history, in multiple depositional environments! 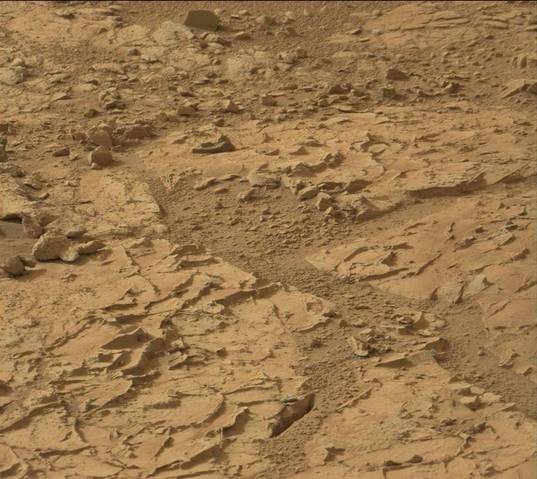 It's exactly the kind of stuff Curiosity was sent to Mars to study. Project scientist John Grotzinger said today that if they had driven all the way to the mountain and found the kinds of rocks they found at Glenelg, they would have been very happy. In fact, the reason that the drilling was delayed from before until after Christmas is because the scientists wanted to spend more time figuring out the geologic context for these fascinating rocks. 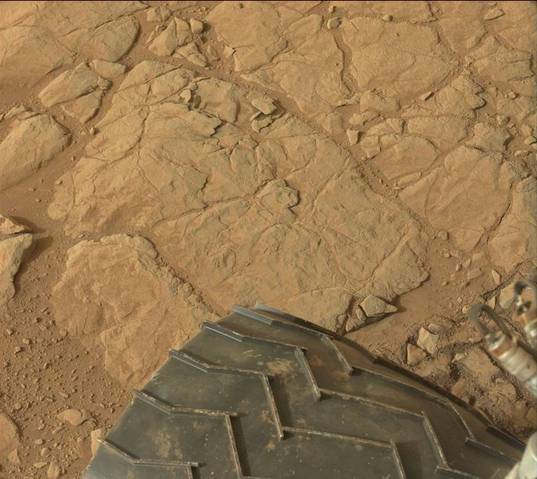 As of sol 157 (January 14, 2013), Curiosity was at the edge of Yellowknife Bay, exploring its fascinating veiny rocks. And here's the view from the ground. 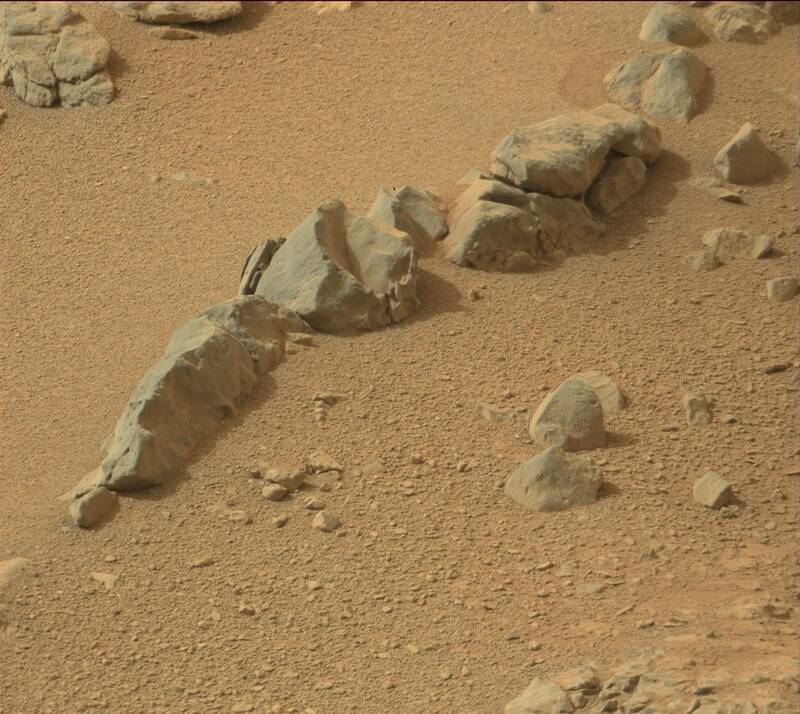 On sol 137 (December 24, 2012), Curiosity sat inside a depression named "Yellowknife Bay." The "shore" of Yellowknife Bay is a layer of rock that makes a distinctive step down. 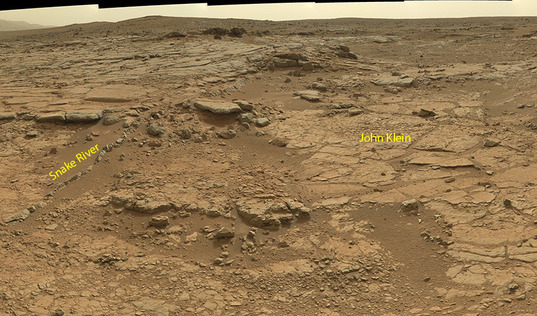 This view is composed of left Mastcam (Mastcam-34) images. In this wacky image from sol 157, the veiny material appears to be made of bright granules separated by darker boundaries. I have no idea what this means, but judging from the way the grains "puzzle-piece" together, I'm inclined to think they represent the growth of individual crystals in the vein. Regardless of how it formed, it looks really cool. An unusual texture was visible in ChemCam images from sol 157. Here, the ChemCam image has been colorized with lower-resolution Mastcam images of the same area. These rocks also often contain concretions, little spherules of some as-yet-unknown mineral. We have, of course, seen concretions before on Mars, the famous "blueberries" at the Opportunity landing site in Meridiani Planum. The science team didn't speculate today as to what mineral could be making these concretions. It will take work to figure out their composition unless they fortuitously come across a "berry bowl" like they did inside Eagle crater with Opportunity; it'll be difficult to take measurements that don't overlap with a lot of the matrix rock, so it'll take work to isolate the concretions' composition. It's not impossible, or even unusual, it's just work that'll take a while to do. The concretions are not necessarily hematite (as it is at Meridiani). The amount of concretions varies from place to place. Here's an example with a lot of them. The "Sheepbed Unit" of rock that forms the floor of Yellowknife Bay often contains roughly spherical features. These are called spherules. These features are interpreted as concretions, implying they formed in water that percolated through pores in the sediment. Spherical concretions have previously been discovered in other rocks on Mars. 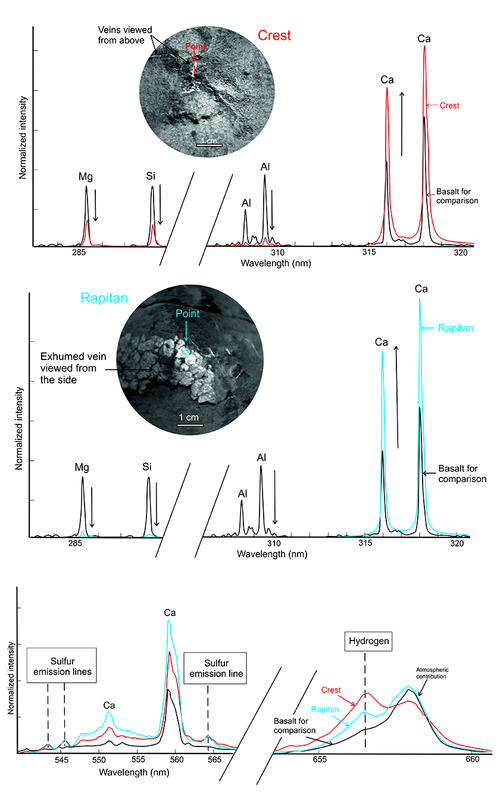 Chemcam analysis of the veins came back showing lots of calcium, very little magnesium or silicon, and the surprising detection of sulfur. Sulfur has, of course, been detected in minerals on Mars, from space and on the ground by Spirit and Opportunity. But apparently its emission lines as seen in laser-induced breakdown spectroscopy are usually very weak, so it's a coup that Chemcam detected it. 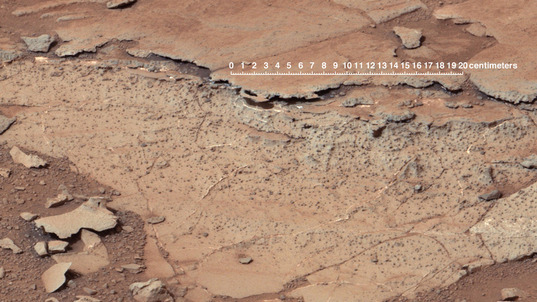 ChemCam views of light-toned veins in rocks in the "Yellowknife Bay" area of Mars together with analyses of their composition. The top image, taken sol 125 (December 13, 2012), shows a close-up of the rock named "Crest." The middle image, taken sol 135 (December 23, 2012), shows a close-up of the rock named "Rapitan." The spectral profile of Crest's light-colored vein is shown in red and Rapitan's in blue, while that of a basaltic calibration target of known composition is shown in black. These results suggest the veins are unlike typical basaltic material. They are depleted in silica and composed of a calcium-bearing mineral. Fainter emission lines, shown in the bottom graphs, identify the presence of sulfur and hydrogen. Scientists interpret these results to mean Crest and Rapitan's light-colored veins contain hydrated calcium sulfates. These minerals could be gypsum or bassanite. On Earth, calcium sulfates like gypsum form frequently in veins when relatively dilute fluid circulates at low to moderate temperatures. The ChemCam analysis helped Curiosity mission managers decide where to use the rover's drill for the first time. In other places, the veins stand up and the rock erodes away, leaving little ridges behind. You see this a lot in rocks on Earth; in igneous rocks the light stuff is typically quartz, while in sedimentary rocks it's typically calcite or gypsum. (In either type of rock there is a host of other possible minerals.) In order for a rock to have veins in it, it first has to (a) be a solid enough rock that it fractures into pieces rather than just smooshing; and (b) have some fluid percolating through those cracks, a fluid that's rich in minerals so that crystals precipitate out. In order for a rock to have concretions in it, the whole rock had to be saturated, with fluid moving through pore spaces in the grains. It seems unlikely to me that the concretions and the veins formed under the same conditions, which would suggest that this rock got wet in three different ways at three different times: when it formed (laid down as a sediment); when the concretions formed; and when the veins formed. There's lots of other types of rocks around, too. There are coarse sandstones, and there are cross-bedded sandstones. Both of these are interesting because their grain size is too large for the grains that they contain to have been transported by wind. 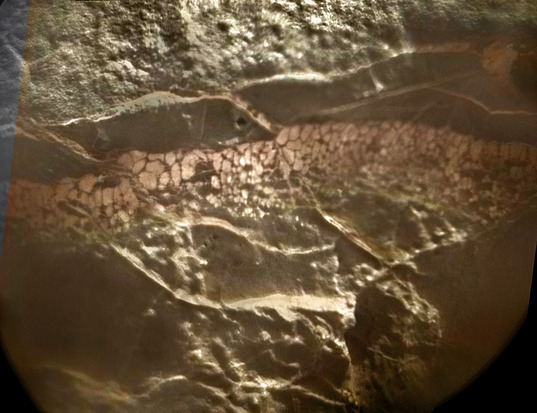 The largest grains in this rock, for instance, are more than 2 millimeters long. Curiosity held its MAHLI camera within 3 centimeters of a ledge on sol 132 to examine its grains up close. The investigation revealed the rock to be a coarse sandstone, made up of cemented grains of a range of sizes. The biggest grains at lower left are about 2 millimeters long, which is larger than sand; technically, they are classified as "granules." The whole view is about 4.3 centimeters wide; at full resolution, it is about 26.1 microns per pixel. The implication is that water, flowing water, had a role in the deposition of these rocks. The stratigraphic postions of the different rocks speak of a changing depositional environment at this one spot: the siltstones of Sheepbed would've been deposited in still water; the coarse sandstones in more rapidly moving water, or in a spot where rapidly moving water debouched into still water; and the crossbedded sandstones in a running stream. None of this -- the evidence for running water, the presence of the sulfate veins -- was anticipated based on orbital data. 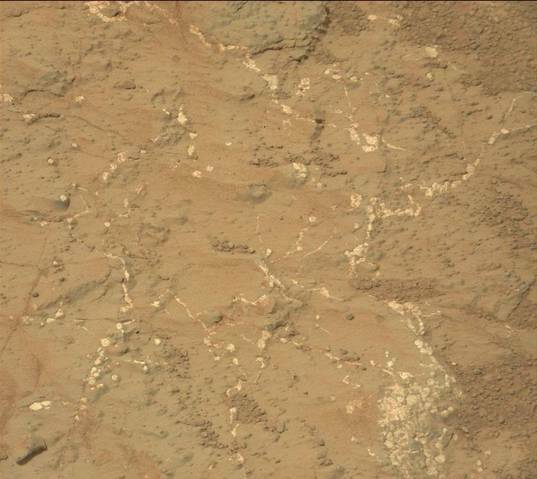 The orbital data told us only that this relatively light-toned rock had high thermal inertia. 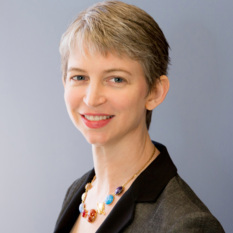 That piqued scientists' interest enough for them to take the risk of sending Curiosity there. The site with the protruding veins, named "John Klein," is the place that they have selected for Curiosity to (finally) drill for the first time. Below is a context image, cropped from the sol 137 panorama I posted, and here's a bit more information on that location. We're lookng to the west, in the general direction of the landing site. 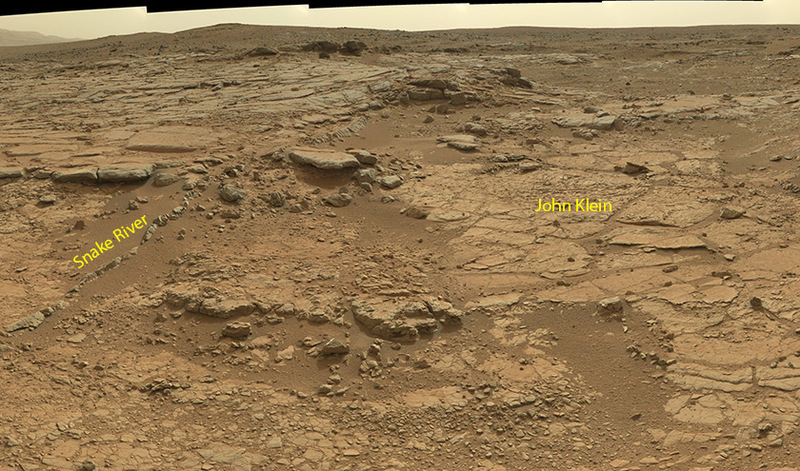 The flank of Gale's central mountain -- where Curiosity will eventually be driving -- is in the far distance at extreme left. 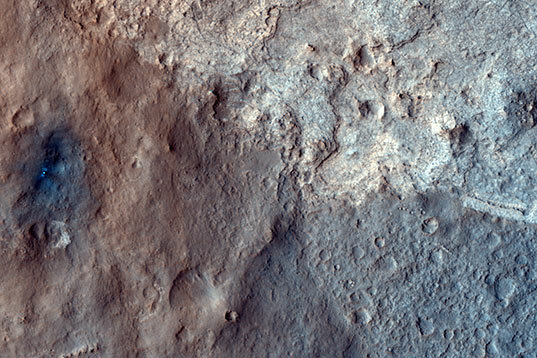 The rover is presently in the location I've labeled Snake River on the map; here is a recent close-up photo of the eponymous target, an interesting dark ridge of material that seems to crosscut the Sheepbed Unit. It's only a few meters to John Klein, so it shouldn't take long to get there. But they can't just drive up to it and drill. The preliminaries will take two weeks. First they have to do a lot of preliminary imaging and chemical analysis with ChemCam and Alpha Particle X-ray Spectrometer (APXS). Then they will brush (they used the brush for the first time on sol 150) and repeat. Grotzinger said today that they would probably drive all over that intricate boxwork of standing veins in order to smash it up. Why do that? Because it gets you fresh material from the inside of the rock without having to drill. Only once they've thoroughly characterized it remotely will they drive up to it and drill it. The first drilling will take a long time because there will be a lot of human checks on each minute step. Once they have drilled into the rock and got a powdered sample, they'll have to repeat that "cleaning" operation they did at Rocknest, where they "rinse and spit" the sample handling hardware several times with rock powder in order to remove traces of material they already sampled, before acquiring the sample that will be delivered to the analytical laboratory instruments, Chemin and SAM. So it looks like mid- to late February before work at Glenelg will be done. And then, it'll be time to hit the road! Hi ya Emily From what you have seen in the data and pictures,can u take a educated guess and say if mars had an atmosphere like earth or not.Or will we have to wait till we get to the mountain before anything points to a earth like atmosphere? I prefer not to speculate -- I'm no more educated about that now than I was before Curiosity landed, so my guess will have no value. I'm willing to wait to see what the mission finds out!